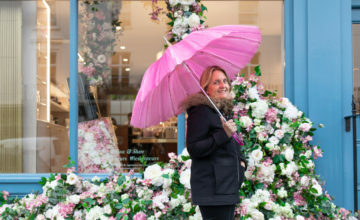 Who: Michelle Feeney, founder of fragrance brand Floral Street. After taking a gap year out at 51 (from being a beauty brand CEO working in, ahem, Floral Street) Michelle spotted a gap in the market for a modern vibrant fragrance brand that was accessible to all. In her view, there were endless experts helping young adults to choose coffee, gin or fitness routines, but no one was helping them become connoisseurs of fragrance. She launched Floral Street to provide high quality perfume at a reasonable price for the modern consumer. 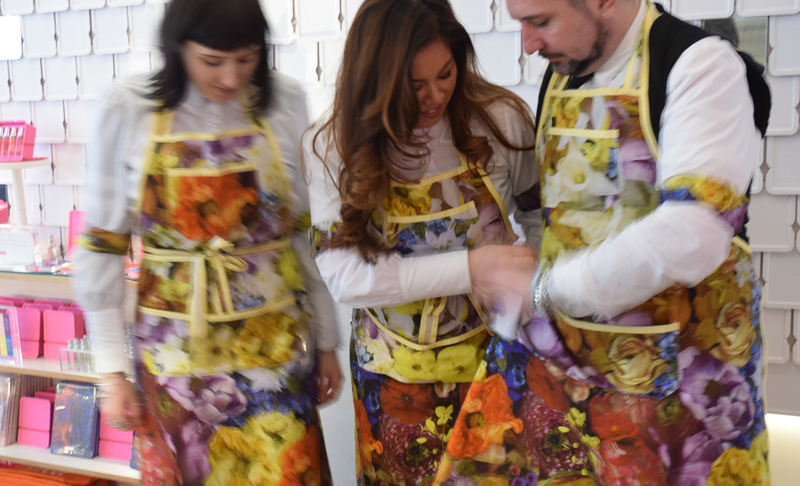 Her first store, in London’s Covent Garden, is decorated with beautiful floral imagery – shot by photographer Matthew Donaldson and features floristas wearing Giles Deacon designed aprons. 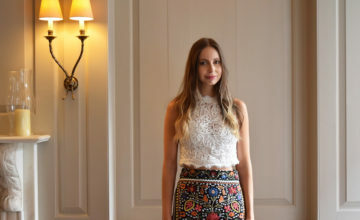 We caught up with her after a successful first few months, to discover what she wears. Today I’m Wearing Iris Goddess by Floral Street, it’s my go to scent and it smells expensive! It’s got a feel of history about it but also real modernity and I think that’s what I’m about. At 54 I like to think of myself as a punk fifty year old! Iris Goddess has a very clear silvery note with a quality and a beauty about it. We briefed (fragrance manufacturers) Robertet and nose Jerome Epinette about what we wanted for Floral Street, and when we went back four weeks later Jerome had created 23 fragrances for us to smell. When I tried Iris Goddess, I cried. It evokes something in me, I don’t know what made me cry, but if a perfume can do that, well, that’s really powerful. Fragrance is crucial to my life from first thing in the morning.The smell of making breakfast for my family, the smell of fresh flowers in my house, the smell of fresh coffee, they’re all really, really important to me. My day is punctuated by scent, it alters my mood and how I feel I use scent to shape how I cope with the day ahead. I really love the quality of Aromatherapy Associate oils, I kind of live by those from a shower perspective – so far, because we don’t have Floral Street body care yet! 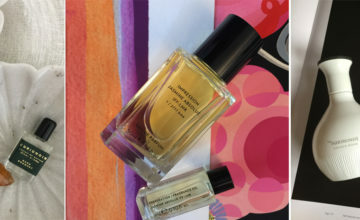 I have a prescriptive approach to choosing fragrance…what do I want to feel like today? I decide what clothes I’m wearing and what my day looks like from a meeting standpoint and then I decide which fragrance I need. If I need to feel strong and powerful I will chose a particular fragrance that I’ll want to enter a room with. Iris Goddess makes me feel quietly powerful, a bit demure, but with Chypre Sublime, you are in the room when you’re wearing it, it’s like ‘I’m here’. If I need a bit of zing it would be London Poppy, which actually it makes me feel slightly younger. Its not a go-too fragrance for me, but having helped create all of the fragrances for Floral Street, it’s made me braver about wearing different types of perfumes. We’ve used 20% fragrance oil in our perfume collection, which is high, and we have naturals in all the products. But what’s more important for me than just using naturals is provenance. Robertet, who construct the fragrance for us, can track the provenance of all its ingredients. They often own their growing fields or are in supportive cooperatives with farmers, so we know where everything comes from. When we built the brand I knew I wanted traceability and transparency. I came at Floral Street from a fashion point of view, with mood boards as if I was creating a clothes range. We chose Jerome, who I call the Sam Smith of perfume because he’s having all the hits at the moment – and told him to do what he wanted. I was inspired by the poet Kate Tempest and her poem Brand New Ancients, and the premise of taking something from the past and making something new, it’s exactly what I wanted to do. I spray fragrance quite traditionally, on my neck first and then I stand up, spray and walk through a cloud of it. I then take a 10ml bottle with me in my handbag because it’s really annoying to have a big bottle in your handbag. I knew I wanted to have both a big and a travel size bottle from the start. I want to challenge department stores and present an alternative. When I was creating Floral Street, I went and looked at lots of fragrance stores and brands and discovered staff standing around spritzing people who didn’t really want to be spritzed. It’s not how we shop now and we wanted to shake things up. Here, we just need to tell our story and our customer responds. The feedback from customers has been amazing. What unusual smells do I like? I love petrol, diesel makes me sick, but petrol I have a bit of a thing for. Also Maurer & Wirtz 4711 cologne, I have a love of that, maybe it reminds me of my youth, or it’s the refreshing energizing element, I always thought that could be a great brand to revitalize, it’s such a refreshing, modern scent.